If a particular chicken cutlet is very thick, slit it open into two thinner slices. Otherwise use as is. Spray a frying pan or nonstick griddle with the cooking spray. Heat it on a medium flame. Lay the pieces of chicken on the hot pan and allow them to sear on both sides, until the insides are no longer pink. For a medium thickness, this should take about 5–7 minutes per side. Remove the chicken from the pan immediately. Allow it to cool for a few minutes on a plate. Slice the chicken into strips and place them in a plastic container. Cover it well and place it in the fridge until Shabbos day. Friday night before you go to sleep (if you remember!) you may want to shake the container a bit to move the chicken pieces around in the juices. To set up the salad, wash the lettuce thoroughly to remove dirt or sand and tear it by hand. Place it in a bowl. Wash and tear the spinach leaves and add them to the bowl. Place cherry tomatoes all around the bowl. Sprinkle the sliced red onion on top. If desired, mix in the cubed cucumbers before topping the salad with the onion. 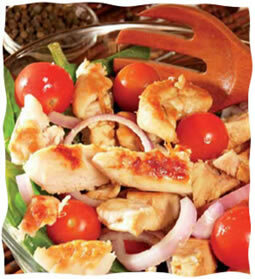 Place the chicken slices on top of the salad. Add abut 3 tsp. of Italian dressing, or just drizzle some olive oil and a bit of apple cider vinegar all the salad. Toss everything together gently and serve. After washing and spinning dry the lettuce or spinach leaves, what's often upsetting is that they seem to wilt and spoil almost overnight in the fridge. To prevent this, store them properly. Spread out a large kitchen towel. Place a layer of lettuce/spinach leaves on it. Cover them with a few paper towels, then layer more leaves. Keep doing this until all the leaves are used. Then roll up the leaf-filled towel as if it's a jelly roll, thereby encasing all the leaves within, together with the paper towels. Place this "jelly roll" into a large plastic bag. Remove all the air and seal it tightly. Then place it on the bottom shelf of the refrigerator, away from the motor. It will last for close to five or six days this way. It's best not to overcook the pieces, as this tends to make them tougher and a bit more dry. It really only takes a few minutes to sear the pieces so that they are cooked through but still juicy. The spinach leaves add a nice touch, as well as adding in necessary nutrients from more green leafy veggies, as well as adding some calcium. It smells great and presents wonderfully. Tamar Ansh is a renowned recipe developer, food columnist, and member of the IACP (International Association of Culinary Professionals). She is the author of three cookbooks, most recently A Taste of Tradition: Pesach—Anything’s Possible! Over 350 non-gebrochts, gluten-free, and wheat-free recipes, published by Targum Press. Reprinted with permission from A Taste of Tradition: Pesach—Anything’s Possible! by Tamar Ansh. freshness in vegetables No need to do anything as described with towels to keep fresh the greens!